VIes Rencontres Africaines de la Photographie. 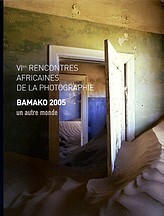 Bamako 2005. Un Autre Monde. Edited by Simon Njami, with a foreword by Moussa Konate. Editions Erik Koehler, Paris, 2005. 253 pp., black-and-white and color illustrations throughout, 9Â¾x13″. Originally published in the Photo-eye Booklist, Spring 2006.